FOLLOW ME TO CHECK OUT MY OTHER FREE PRODUCTS AS THEY ARE RELEASED!!! 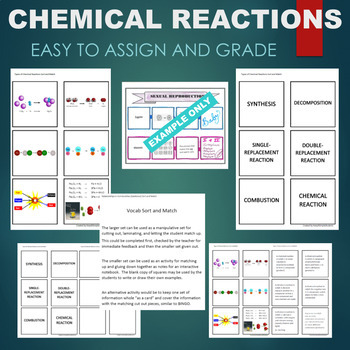 This no-prep activity involves matching the following Types of Chemical Reactions (Combustion, Synthesis, Single-Replacement, Double-Replacement, Decomposition) to descriptions and images. It can be used as a hands-on sort and match or cut apart and glued into an interactive notebook. Two sizes of templates are available in this download. Instructions and suggestions are included in this product as well as a numbered answer key. Please remember to review all purchases so you can earn TpT credits to be used on future products.